Khentii aimag. Region of Mongolia. Aimag. Aimak. Place to visited in region of Mongolia. Sights of intersest. Khentii aimag. Ondorkhaan. Dashdeejetliin monastery. Gundgavirlan monastery. Dadal. Chinggis Statue. Khentii aimag was established in 1930. Khentii aimag is the birthplace of the Great Emperor Chinggis Khaan. It is situated in a region of great natural beauty, yet only a day's (331 km) drive from the capital city Ulaanbaatar. It borders in the north with the Russian Federation. Khan Khentii Mountain aimag with the administrative units consisting of 25 khoshuus, 2 shavis, 109 soums, and 328 baghs (the smallest administrative unit). 80 thousand square kilometers. The aimag administrative centre is Underkhaan, which is ideally located as a gateway to the Eastern Mongolia. Hentii aimag accommodates part of the giant Khan Khentii Protected Area covering over 1.2 million hectares of the rugged Hentii mountains, being bordered with Terelj National Park to west. There are several peaks that rise over 2000 meters above sea level, with the highest one being Asralt Khaikhan (2,800 meters). Khan Khentii mountain range has preserved its original features, and is located between Eurasian coniferous forest taiga and Central Asian arid steppe. There are over 70 rivers of a various size, including the three large ones the Tuul, Onon and Kerulen that have their sources from numerous springs at Hentii range, where lies the world watershed of three huge drainage basins: the Arctic Ocean, Pacific Ocean and the Inland Basin of Central Asia. The Tuul flows northward across the Russian border and into Lake Baikal and on to the Arctic Ocean, the Onon and Kerulen both flow eastward to join Amur before emptying into Pacific Ocean. The climate, soil and landscape change as one goes from the West to East, The annual perception is about 8-12 inches (200-300 mm). Hentii aimag is rich in therapeutic hot & cold springs such as Gurvan nuur, Ono, Avarga toson, Tars and others, used for medical purposes. The prime sector of its economy is agriculture, including animal husbandry. Horses, cows and sheep prevail in the husbandry. The area, specifically the town of Galsher in the south of the aimag is famous for its fast horses. The racehorse from this place, known "Elbeg" won the nation-wide horseracing competition 17 times. Nowadays, Hentii aimag represents one of the tourist attractions. It has many historical places, especially related to the life of Chinggis Khaan as he was born, grew up, raised to power, was crowned, and considered to be buried here. These attractions include Khokh Nuur (Blue Lake)--place where Temujin was crowned as Chinggis Khaan in 1206, Ikh Aureg (Palace) of Chinggis Khaan--the site closely connected with the historical work "The Secret History of the Mongols" (Mongolyn Nuuts Tovchoo) written in 1240, Doloon Boldog in Kherlen Khuduu-Aral, often mentioned in this masterpiece, Gundgavirlan monastery built in 1660 and reopened in 1990s, an impressive Chinggis Khaan Statue in the Gurvan Nuur, built in 1962 to commemorate the 800th anniversary of his birth, the Galtai Agui ( a 80 meter deep cave), and others. Khuduu Aral is a plain about 30 kilometres long and 20 kilometres wide on the meander of the Kherlen river, west of the Kherlen Toono, and south of the mountain of Kherlen Bayan Ulaan , at the altitude of 1.300 m above sea level. The site of Ikh Aurug (palace) of Chinggis Khaan is on this plain. This site is closely connected with the historical work "The Secret history of the Mongols" because it was finished exactly here. To honour the 750th anniversary of this event , a historic monument was erected here in 1990. Hereabouts are places such as Doloon Boldog and Shilhentseg, mentioned in " The Secret history of the Mongols " . The Khan Khentii State Protected Area is situated in the territory of Erdene and Mungunmort soums of Tuv aimag, Batshireet and Umnudelger soums of Khentii aimag, and Yeruu and Mandal soums of Selenge aimag, with the rivers Kherlen, Onon, Tuul, Minj and their tributaries. The area encompasses 1,227,074 hectares of the rugged Khentii mountains, streching from just north-east of Ulaanbaator to the Russian border. It has been protected since 1992. Khan Khentii mountain range has preserved its original features and is located between Eurasian coniferous forest taiga and Central Asian arid steppe. The sources of three major river systems spring from the protected area: the Tuul which flows to Russia's Lake Baikal and on to the Arctic Ocean, and the Onon and Kherlen, which flow East to join Amur before emptying into Pacific Ocean. The Khan Khentii mountain range represents basic characteristics of a natural zone and includes 5 kinds of landscapes of real taiga. It's also the ancestral home of Chinggis Khaan. The peak of Tsogt Chandmana Uul, at the end of the Khentii Mountain Range, is the world watershed of three huge drainage basins: the Arctic Ocean, Pacific Ocean and the Inland Basin of Central Asia. This mountain is located only 80 kilometres south of Ulanbaator, with an elevation of 1,854 meters above sea level. The Avraga is a small river which takes it's source from the mountain of Kherlen Bayan Ulaan, and falls to the south into the river Kherlen. There is a spring on the valley of the river Avraga, with a composition including bicarbonate and carbonic gas. The river was named the Avraga because of the palace of Chinggis Khaan which was built on it's bank. It is considered that a hill, at an altitude of 1,231 meters above sea level and located north-west of the center of Binder soum, is the place where Chinggis Khaan was born. The lake of Gurvan Nuur Rashaan is located in the center of Dadal soum, at an altitude of 800 metres above sea level. The waters include sulphur, sodium, potassium and magnesium. For this reason a health resort has been opened for people who suffer from cardiovascular, digestive, skin and venereal deseases. 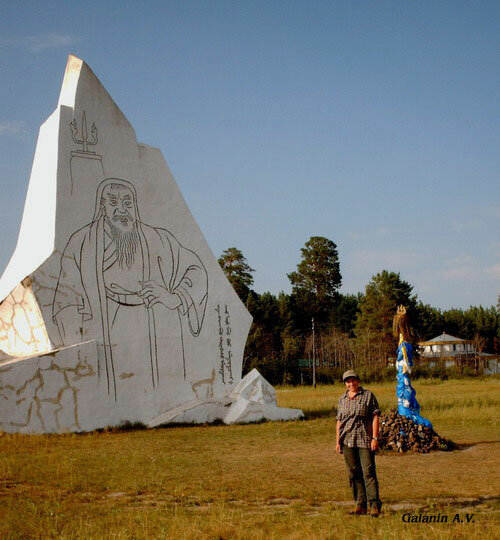 Gurvan Nuur Rashaan is also famous for the first monument to Chinggis Khaan, erected in 1962. Ondorkhaan. Population 17,000. Eelevation 1027m. The aimag capital, Ondorkhaan, which means 'high king', is in one of the flattest and driest parts of Khentii aimag. The river, the Kherlen Gol, flows through the southern part of Ondorkhaan, however, providing the cattle with water and grass, and the locals (and brave foreigners) with a good swimming hole in the hot summer months. Most of the residents live in wooden buildings, so gers are relatively few in number. Ondorkhaan, a sleepy place, is far nicer than the other two eastern aimag capitals. It is perfectly located as a gateway to eastern Mongolia, so you may need to stay here to arrange onward transport or to break up a journey if you are heading to/from other places in the East. The Ethnic Museum, next to the City Hall, is one of the best of its kind in the country and is certainly worth a look. It contains a few ethnic costumes, Mongolian toys and some religious artifacts, such as statues, scroll paintings (thangka) and books that must have been rescued in the late 1930s. The four museum buildings were the 18th century home of the Tsetseg Khaan, a Mongol prince who governed most of eastern Mongolia during the Manchu reign. Dadal. 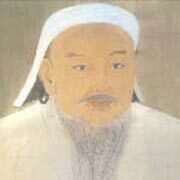 As written in The Secret History of the Mongols, it is now generally accepted that the great Chinggis Khaan was born at the junction of the Onon and Balj rivers (though his date of birth is still subject to great conjecture). The assumed spot is in Dadal sum (district), near the town of the same name (also known as Bayan Ovoo). Dadal is a gorgeous area of lakes, rivers, forests and log huts (very few people live in gers) - reminiscent of Siberia, which is only 25km to the North. Even if you are not a Chinggisphile, there is no shortage of scenery to admire and hike around in. It wouldn't be hard to stay here a few days. The downside is that it often rains here in summer. The 415,752 hectare Onon-Balj National Park was established in the region in March 2000. Dadal is in a sensitive border area so it would be wise to register with the police. If you are heading any further out of town it would also be a good idea to register with the border guards, on the west side of Dadal. Things to see. Three kilometres north of Bayan Ovoo is a collection of hills known as Deluun Boldog. 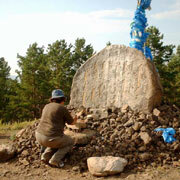 On top of one of the hills is a stone marker, built in 1990 to commemorate the 750th anniversary of the writing of The Secret History of the Mongols. The inscription says that Chinggis Khaan was born here in 1162. Some historians may not be entirely convinced about the exact date or location of his birth, but it's a great place to come into the world: the scenery and hiking around the valleys and forests are superb. There's a more impressive Chinggis Khaan Statue in the Gurvan Nuur camp, built in 1962 to commemorate the 800th anniversary of his birth. Onon Hot Water Mineral Springs. About 1km West of the statue is the Khajuu Bulag mineral water springs, where the great man once drank. Take your water bottles and fill them to the brim, because this is the freshest (flowing) spring water you will ever taste. You could also hike up into the hills behind town, where there is a large ovoo (sacred pyramid-shaped collection of stones). Activities. There are several trekking routes out of Dadal. Locals recommend the 30km hike to the junction of the Onon and Balj rivers, or the 45km trek further along the river to the gorge at the confluence of the Onon and Agats rivers. You'll need to inform the border patrol of your itinerary and it would be wise to take a guide (this is not a good place to get lost!). Ask at the ger camps or try to track down an English-speaking local. Locals, and some historians, claim that Avarga, not Karakorum, was the first capital of the Mongolian empire. The ancient city is located on a 20km-wide plain, Khodoo Aral (Countryside Island), so named because the area is encircled by the Kherlen and Tsenheriin rivers. Things to See. The biggest and most impressive of the various statues and monuments in the area is the Chinggis Statue, 13km South of Delgerkhaan village. It was built in 1990 under the sponsorship of Unesco, to commemorate the 750th anniversary of the writing of The Secret History of the Mongols. The symbols on the side of the statue are the brands used by about 300 different clans in the area for marking their livestock. Khokh Nuur. About 35km north-west of Tsenkhermandal, the small Khokh Nuur (Blue Lake) is said to be where Temujin was crowned Chinggis Khaan in 1206. There is a small plaque that marks the coronation spot, which some say was attended by 100,000 soldiers. It's not a required stop on the Chinggis Khaan pilgrimage trail but it provides a nice place to break a jeep trip. A further 30km away is the larger and prettier lake of Khangil Nuur. Baldan Bareven Khiid. This monastery in Omnodelger sum was first built in 1777. At its peak it was one of the three largest monasteries in Mongolia and home to 1500 lamas. It was destroyed by thugs in the 1930s and by fire in the 1970s. Now only ruins remain. The monastery is currently being restored by tourist-volunteers under the auspices of the American-based Cultural Restoration Tourism Project (CRTP). The project is due to be completed by 2006. Burkhan Khaldan. This remote mountain, known as God's Hill, in the Khentii Nuruu is one of the sites mooted as the burial place of Chinggis Khaan. Over 800 burial sites have been found in the region, though the main tomb has yet to be located. Whether or not Chinggis was buried here, The Secret History of the Mongols does describe how the khaan hid here as a young man and later returned to give praise to the mountain and give thanks for his successes. Because of its auspicious connections, Mongolians climb the mountain, which is topped with many ovoo, to gain strength and good luck. The hill is very remote, in the Khan Khentii Strictly Protected Area. To get there, head to Mongonmorit in Tov, then travel North along the Kherlen Gol. This is also a great place to reach by horse. The map of Khentii aimag.